My fiance is obsessed with Monster’s Inc. to the point he had to borrow a friend’s child to go to the cinema to watch it in 3D because he thought he’d look at bit odd watching it on his own surrounded by families. 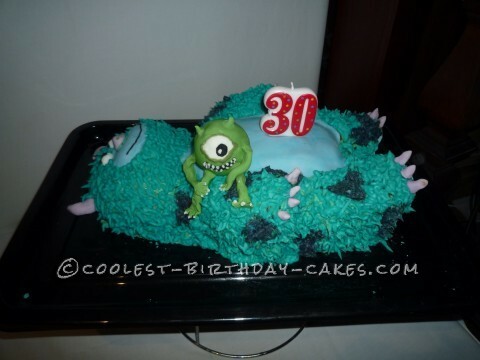 For his 30th I surprised him with a Sulley birthday cake. It was red-velvet inside, so it was like cutting into the red of somebody’s inside (my own little joke!). I used one of his Sulley teddies to copy the design. I did a large square and a circle of cake and cut chunks off until I got a good shape. The fur is piped butter icing, with the detail and Mike made out of fondant. The worst moment was when I arrived at the venue and a food had fallen off, so I pinned it back on with some cocktail sticks. This was my first attempt at a large cake that is molded into something and has inspired me to do many more!